On the border with Turkey and Armenian, a ruined ancient city holds some stunning landmark structures of which one is the Tigran Honents church. Dating from 1215, it took its name from the wealthy Armenian merchant that ordered and paid for its construction. Upon first sight, its small size dumbed down the intricate architecture but on closer inspection, the extreme detail on the outside of the church won my admiration. Ornate animal carvings were placed on each exterior wall and historians suggested they were added later, when Ani fell under the rule of the Ottoman Empire. Rather than ruin the aesthetic look, the additions of the carvings completed the overall appearance. Inscriptions had also been carefully carved into the stone on the eastern wall. The language was unrecognizable, making me think of the church as a long lost sacred place of an ancient tribe. 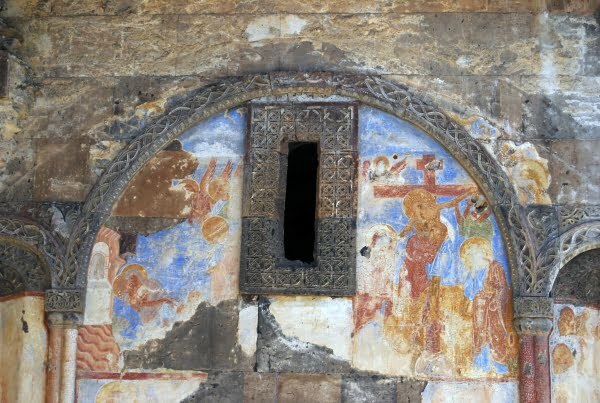 At the time of construction, the area was under Georgian rule and this explains the extensive interior frescoes, which were not typical of Armenian architecture. All the frescoes detail the life of Jesus and Saint Grigor. The most disappointing aspect is that some of the frescoes have been ruined with tacky tourist graffiti. Even though, it is called the Tigran Honents church, other names include the Church of St Gregory the illuminator and the Church of Sirli. Irrelevant of the name, it was hard not to be impressed when I stood in the middle of the building that is nearly 800 years old. As I exited the church, I spotted Armenian watch towers in the far distance. They seemed to be empty. Infact, walking around the ruined city that spreads over a vast landmass, most of it was empty. Not many tourists venture in this direction and it seems that travel brochures are reluctant to promote it, since the area is devoid of beaches, and restaurants. The Tigran Honents Church is part of a forgotten city that the rest of the world knows nothing about. This article is part of a series about the ancient Armenian kingdom of Ani. I can read the inscription its in Armenian. Armenians have many interests in Ani, unfortunately the Turkish government had made the sight off limits for a long time and only recently has it become a touristic site. Thank you for your comment Alejandro. I will research that because never heard of it. If you have not already read it, I can recommend a book by Giles Milton called Paradise Lost. It is mainly based in ancient Smyrna, but talks about Armenians, Kurds, Jews and Ottomans throughout the east, in Izmir and also the Anatolia region. In the case of Armenia, and based on what I have read about three decades or so ago, it is aprirpopate.The Ottomans were brutal.During my 2008 visit to Macedonia, I discovered that 5 member’s of my mother’s family as members of the Smilevo cheta’s under the leadership of one Damian Gruev. fought the Turks in a short lived uprising in 1906. They famously made a canon from the trunk of a cherry tree, which now is a museum piece in Turkey. But in the aftermath of the quashed uprising, the Ottomans burned all but one of the 700 houses in Smilevo. And you my dear – do not read properly. Historians suspect the carvings were added during Ottoman time. I clearly state this therefore it is not my speculation. It is that of historians. I discuss the arguments in the article about the cathedral of Ani here https://turkishtravelblog.com/cathedral-ani-fethiye-mosque/ which obviously you did not read either. The external descriptions were unrecognisable to me. What do you want me to do? Pretend I recognized them when I did not. Perhaps you should read my About page before you start criticizing me. I am not a qualified historian or guide and “My About” page clearly states this. Re the whitewashing of the frescoes, why didn’t you just simply write “Hi Natalie, did you know many of the frescoes were whitewashed over in history?” Why the negative attitude? My knowledge is taken from guide books, history books and people that I speak to. Is it my fault that this was not mentioned? Again, I think you should read my About page, then come back and criticize me. Re the Turkish government – What makes you think they will ever protect this site? They are currently running around the country, trying to turn Byzantine structures into mosques. Ani does not even feature on their list of importance. If you think otherwise, you are dreaming. So, who does the responsibility fall to, so that Ani can be known worldwide, as an important historical structure? You can reply to this comment, if you want to debate in an adult fashion but if you come back with the same attitude as your first comment, it will not be published. And yet you are publishing incorrect information on your blog. For example, you speculate that the external carvings are from Ottoman times. You should surely be aware that this is not necessarily the case. 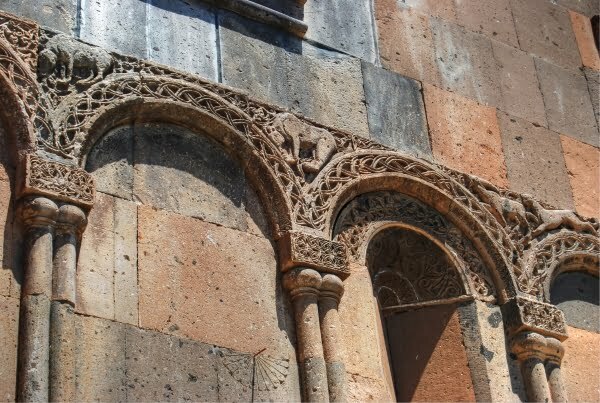 Ani Cathedral, not too far away, has external carvings, as does the 10th Century Church of the Holy Cross on Akhtamar in Van (present-day Turkey). 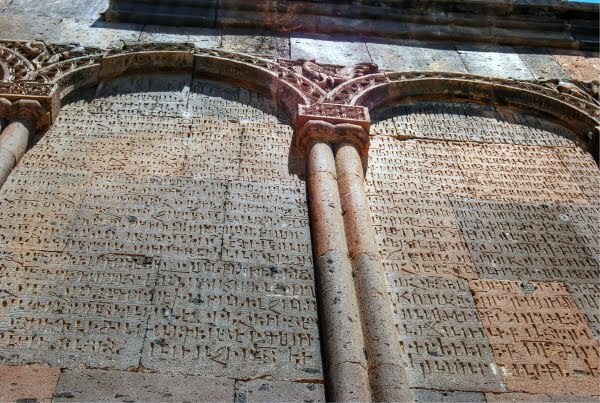 You call the external inscriptions “unrecognizable”, whereas they are clearly Armenian. You mention the graffiti on the frescoes, yet you fail to mention the fact that several frescoes were intentionally whitewashed over. You deplore the fact that the Armenian government has not taken an interest in the structure, yet ignore the fact that the structure is on Turkish soil–what exactly do you expect the Armenian government to do? The fact is that you are a fraud and a propagandist. I suppose we should be grateful that at least SOME of your information is correct. Hi Hovhannes, Thank you for taking the time to write your thoughts down. None of what you write has surprised me. Yes, I have heard the stories of Ataturk as well. You ask why I don’t side against Turkey on this matter, however now you are veering into political discussions not travel writing. I am also quite sure that you are aware of publishing restrictions that are often placed on the internet by the Turkish government. I hope that answers your questions. Hello Natalie. 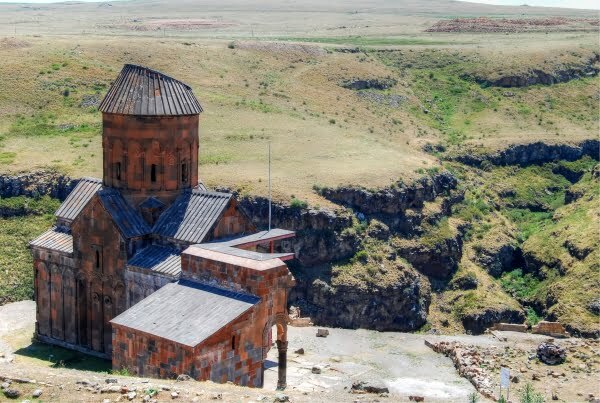 I have been reading some of your articles, and a common theme I have noticed in them is the complete lack of any mention of the architecture in Western Armenia (Eastern Turkey) having anything to do with Armenians. When you are relaxing on a beach in Trabzon, you are completely unaware that you are feet away from the bones of thousands of drowned Armenians. Even though Ani is the former capital of Armenia, you fail to even mention Armenia in most of your articles about Ani. You leave the reader with some kind of impression that the Turks used to be Christians or that these were abandoned long ago by the Byzantines, even though Armenian presence in this land predates both, when the truth is much darker: that the thousands of Armenians who lived in this city were slaughtered. And now that I’ve finally found one of your articles that acknowledges the antiquity presence of Armenians, you are not only defending the Turks who are solely to blame for the current state of the city, but you are also accusing the Armenians of neglecting it. Are you aware that Turkey has illegally closed its borders with Armenia, technically an act of war, and maybe that is why the watch towers are abandoned? Do you expect them to cross over the border and make repairs at the risk of being shot the entire time? To say that you cannot find can “not find any documentation by the Armenian government proving an interest in Ani” is a very pitiful excuse. Just goggling Ani and checking any website like Wikipedia (which you’ve linked before) will tell you everything. Even before the blockade, entry to Ani from Armenia was forbidden. Turkey harms the churches not only because they are useless to them, but also because they are precious to us. For most of the past 100 years, entry to Ani has been forbidden to tourists without a permit, which had an intentionally lengthy process to receive, and even then taking photos was forbidden, so as not to expose Turkey of further committing cultural genocide. Perhaps its frightening for you to hear the fact that the Turkish people you have come to adore so much have a history as ugly as Nazi Germany. Even throughout World War 2, Turkey was leaning heavily in favor of joining the Axis powers, waiting for the moment that Germany would have victory guaranteed (just as they had in World War 1), but that moment never came. Turkish troops were deployed all over the Armenia border, ready to take Armenian land and more prior to the defeat of the Soviet Union. Perhaps if that happened, you would be visiting land take Armenia still holds now and still be writing about “beautiful, wondrous Turkey” (calling it such would be just as legitimate). You may be so in love with Turkey that you refuse to side against it, but look at how it is affecting your writing. By taking a pro-Turkish POV, you are also partaking in genocide denial and assisting in cultural genocide. The fact is, it’s NOT Turkey. You write about how much you love it and couldn’t leave; how do you think we feel when we were forced to leave our home, which you now call home, at the risk of being killed? You are mostly walking on land that belonged to and should still belong to Armenians and Greeks. Why doesn’t it? Because before the Allies neglected to defend the Treaty of Versailles, they had previously neglected to defend the Treaty of Serves. I assume you have heard many times in Turkey that the battle of Gallipoli and on were all blamed on “British imperialism” and sympathetically felt guilt every time, while unaware that it was in fact to stop Turkey from committing further crimes on Christians. Would it shock you to hear that the God-like Ataturk you have only heard praise about was directly responsible for the deaths of over 500,000 Greek and Armenian civilians? All the while the UK and other Allies were hardly lifting a finger to stop them and Churchill was having a good time getting drunk, off of Armenian brandy no less. In conclusion, I’m not mad and not trying to sound hateful. All I want is for you to be aware of the hurtful things you are writing, to stop doing it in your articles, and to apologize to the Armenians who you have offended. I really hope to hear you respond. Apologies for not replying earlier. I have been thinking about your comment and still have to find the time to fully read the website that you posted. Obviously as well, I want to find material written by Turkish people regarding their opinion on the matter. At the moment, it is not something that I can firmly say I believe on either side as my knowledge of it is just what I glean from the internet. Thank you for bringing attention to Ani. Much appreciated! A bit of possible (apology Nataly if I’m assuming too much here) explanation for Nataly’s angst which stems from someone deeply hurt because of Turkey’s ongoing Genocide of the Armenian people. I say ongoing, because denial is said to be another stage of genocide. Turkey has been at denying the Armenian Genocide for nearly 100 years now and relegating the historical Armenian presence in Ani is a prime example of such denial, i.e. such cultural genocide. I’m Armenian myself and in fact have visited Ani as part of a tour of eastern Turkey which Armenians know as Western Armenia. We call this Western Armenia because because for some 2,500 years this land was the homeland of the Armenian people and yet in the years of 1915 – 1923 it all ended in the Armenian Genocide where some 1.5 million Armenians were killed and the remaining (a million or so) deported from their land and essentially forbidden to return. To make matters worse, Turkey now implements cultural genocide on the Armenians by denying our history in a land that for millenia was known as the Armenian plateau. In my travels there I was agast at so much blatant historical revision, i.e. that the Armenians were just a small tribe of people that never really mattered in this land. This crosses into modern times with the Turkish blockade of Armenia, effectively preventing anyone to cross the border from Armenia into Turkey. Given this, can you imagine how difficult the Turks can make it for Armenia to do anything with Ani. When I was a young boy I remember how sad I felt when people asked me what an Armenian was. I would despertately tell them they Armenia was the site of Mt. Ararat (actually another historic Armenian site that the Turks occupied) where Noah’s ark landed or that Armenia was the first nation to accept Christianity. None of it really mattered because Armenia in those days was part of the Soviet Union, i.e. it didn’t really exist to the Western World, and why did it not exist? Largely because the Turks tried to wipe Armenia off the face of the earth, and now those same Turks (certainly not all of them) want Armenia to just go away into the ashbin of a forgotten history. I hope this gives you some insight into why Armenians can get so wound up about historical accuracy. You see, we’ve been in an all out battle for nearly 100 years now, just to stay around on this earth. At times quite honestly we’re scared to death that our nation, our people, that have played a part in this planet’s history for some 2,500 years are not going to make it because of what happened in 1915. I want to end this by again saying Thank you for bringing attention to Ani. Much appreciated! If you like have a look at http://www.armenian-genocide.org/ for more information on the Armenian Genocide. 1 – This is not the cathedral. This is the Tigran honents church. Please see the bit in bold. Also if you really gave any interest in Ani or the Armenian heritage, you would provide me with further reading resources instead of ranting and raving to make yourself feel better. Leaving a comment on a blog does not put you on a higher pedestal. If you are so upset my my series of posts on the city, then educate me. But before you do that, make sure you read all of them first. I landed on this post by pure coincidence and although I am late to comment given the original post date, I could not help but comment. What a disgrace to Armenian culture and history this post is! What a shame you have portrayed Ani and its cathedral so wrongfully! Ani is an ancient Armenian city that was conquered by the Turks (who are responsible for the first genocide of the 20th century against exactly the Armenian people in case you were unaware!). This church is Armenian, including the scriptures on the outside! I can’t believe you could not find that out! Also, the crosses that once ornated the church were destroyed by the Turks, what a disgusting sign of utter disrespect. Your claim about the Armenian government not wanting to claim Ani back is false! Armenia is nothing but very interested to gain back all of its once Armenian land that was stolen by the Turks and is currently still fighting for land. Armenia is proud of its heritage and culture! In fact it is one of the proudest populations I know. Of course Armenia is interested in its heritage, what a ridiculous assumption to say the opposite, shame on you and if you knew the least bit about world politics you would have known that the Turks have made it impossible for the Armenians to move forward with any such plans. Before writing such posts, please inform yourself! You have wrongfully portrayed an entire population and culture! Glad you liked it Ozlem – the whole site was amazing for me and that is why I had to split it into over four posts. Too many photos! Shame that is not on most tourist lists NT as the money made from entrance tickets could contribute towards the restorations. And incredible site Natalie, the inscriptions, frescos, all breathtaking – do hope it gets the attention it deserves. this site is just unbelievable, Natalie. I can’t believe it isn’t on most tourists’ radars! I could easily spend 2-3 days there.